This table of characters with its grid of rows and columns represents the culmination of my life's work on the origin of the alphabet. At first glance it may be overwhelmingly mysterious and incomprehensible, but I will take you through it gradually, line by line, starting with the letter A . First go to the heading ROME on the far right, and run your eyes down that column. All the letters should be recognizable (I have tried to print them clearly in block letters, as required on all official forms). Not all the letters of the Roman alphabet are there (FJWXY are missing), so you could be thinking this document is to be suspected, or rejected, as flawed (but I would be floored and dejected, if you did). Those Roman letters were derived from the Greek alphabet (so called because its first two letters were named Alpha and Beta), and you can see the standard Greek forms to the left of each Roman letter; but you will sometimes need to look further left in the GREECE box to see what the Romans copied, notably for C/G, D, L, P, S.
Concentrating now on the letter A: it is derived from the Greek Alpha. That name means nothing in Greek, but it was borrowed from the Phoenicians in the 8th century BC(E), and in their language (Phoenician, and Hebrew) it did have a meaning: 'alep(h) says 'ox', and looking along the row, back to the Bronze Age, a millennium earlier, we find that the original Canaanite (West Semitic) form was 'alp. Because of the antiquity of the name'Aleph, I have chosen to say "A is for aurochs" (rather than "for apple"), the ur-ox ('original ox') being the extinct wild animal that was the ancestor of domesticated cattle. 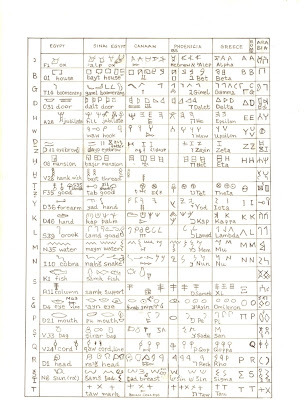 Now, a surprise as astonishing as a cow jumping over the moon: there is a stark qualitative difference between the list of Greek and Roman characters on the far right of the chart, and the list of sounds the original letters represented (in the column on the far left). Can you spot the difference? There are no vowels in the first column. Instead of A we see an apostrophe ('). There is another one (meant to be the 6-shaped one) at the section dealing with the letter O (originally an eye). The ox-sign did not represent the vowel a in the beginning, but the 'glottal stop'. It is a silent consonant! You can experience it in English if you say "over and over" without running the words together, but putting a glottal stop before 'a and 'o. There is an important feature about the way the letters of the proto-alphabet could be used in their early days (in the Bronze Age). They could also be used as logograms or rebuses: the ox-sign could stand for the word for ox ('alp) and for any other word (or part of a word) which had the same consonants ('-l-p). You wil not find that fact in books you read, but it is a discovery (rather than an imaginary invention) of mine. The heading ABGDT shows the first four letters and the last, in the Hebrew and Phoenician alphabet, but it originally included a Kh between the G and D (boomerang and door). 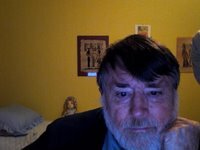 More information and elucidation is available at the Cryptcracker site, notably at the Abt Origins and Original Abt pages, but it comprises a whole course on early writing systems.